We would like to improve our services providing the most innovative and efficient tools for the dental technicians. 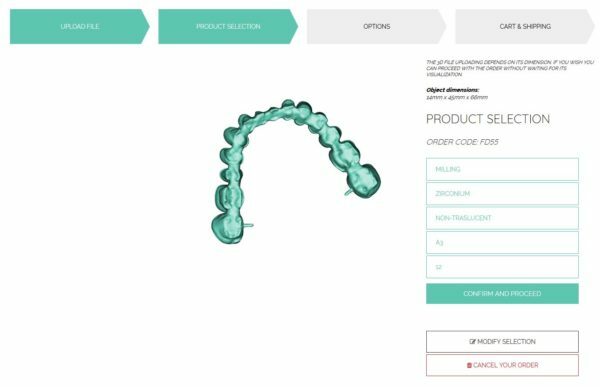 For this reason we created our reserved area, which allows you to upload easily and rapidly your .stl files and the production of laser melting, milling and resin tooth prosthesis. Our milling and 3D printing center has always been guarantee of the highest quality on market. Once you have registered on our reserved area, you will be able to upload your files, visualize them on 3D and select the desired manufacturing for which, if you need support, our technicians will advise you best. Yndetech store is a very simple tool, allowing you easily do everything on your own, without omitting an assistance service always at your disposal. When your order is complete, you will be able to consult your order history and verify the production progress until the courier delivery, selected directly by you. We have indeed introduced important features, online beginning from March, 26. If you are already our customer, you will receive a practical guide helping you to move between the various sections of our store; if you have not yet tried our services and would like to become our customer you can click here and register in few minutes.